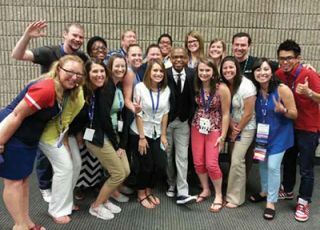 ISTE isn’t about who you know, but who you meet. Attendees with keynote speaker Kevin Carroll, author of Rules of the Red Rubber Ball. ISTE 2014 may be one of, if not the, most hyped educational conferences that I have ever attended. The conference has lived up to its promotional hoopla. The numbers released on the ISTE Connects Blog are quite impressive. There were over 16,000 registrations, participants from 67 nations, and 496,000 tweets with the #ISTE2014 hashtag. With these kinds of numbers, and the local coffee shops serving more than 5,000 cups of coffee, it’s safe to say having ISTE in town is a win. Although it was nice to have eaten one of the 14,000 popsicles handed out, it was tough getting into some of the more popular sessions with the big name presenters. But it’s ISTE, so there are multiple sessions to take part in. You could also take advantage of the real reason to attend most conferences: the networking that takes place outside the sessions. The most valuable way to build your personal learning network is through relationships. We spend hours networking through social media, participating in ed chats, connecting through Google Hangouts, and pinning resources on Pinterest to share with our peers. But at the end of the day, having the opportunity to meet face-to-face with like-minded educators at ISTE is invaluable. The Blogger’s Cafe at ISTE has become a popular hangout where you can meet others for the first time, share your educational experiences, and catch up with old acquaintances. There are opportunities for networking everywhere at ISTE—even just waiting in line for a cup of coffee. ■ The establishment of 1:1 initiatives in our country seems to be becoming more of a norm than a rarity. Chromebooks appeared to be the overwhelming device of choice for many educators I spoke with. The common thread from most users was the device’s speed, ease of management, and success with the online testing pilots. ■ Chris Lehmann continues to be a favorite presenter among ISTE attendees. His presentation based on the Ten-Word Statement connected with educators and made for easy dialogue. Give it a try: “Technology means I have to let go of….” #istetransforms. ■ The conversation prior to the session on “E-rate Modernization: What Changes are Being Discussed?” was interesting and valuable. I learned about the #raisetheeratecap debate and had meaningful discussions with other district representatives on how they plan to adjust to the possible changes to the plan. Anyone who is involved in e-rate discussions needs to stay involved and abreast with the process and let your voice be heard. ■ The ISTE mobile app had a networking game that allowed attendees to ask others for their secret names. The incentive for gathering secret names was competing for a trip to ISTE 2015 in Philadelphia. While the game was fun, networking was the real payoff. I was a bit skeptical at first, but I actually made a number of contacts from around the globe while waiting in line for the keynote speaker. I will definitely reach out to these educators during the school year and collaborate with my new peers to keep the conversation going. With 16,000 educators gathered in one location with a common mindset, great things are going to happen. See you in Philadelphia in 2015!